IN JULY apprentices from the Watermen’s gild race from London Bridge to Cadogan Pier in Chelsea, passing under eleven bridges. It is called Doggett’s and is claimed to be the longest running continuous rowing race ever. There is a fascinating irony because if the watermen had had their way centuries ago there would be no bridges to pass under. Not to put too fine a point on it they were a key part of what must be one of the most successful monopolies of all time. Together with the City of London and the Church (in the form of the Archbishop of Canterbury) they succeeded in stopping any new bridges being built for over 600 hundred years. Opposition had been going on for centuries before but their power was greatly increased in 1510 when Henry Vlll granted the watermen a monopoly of conveyance on the Thames. This helped them stop any new crossings from being built until 1750 when Westminster Bridge was built. From Roman times until 1750 London had only only one crossing – the famous London Bridge with all those houses built on top. It was the first stone bridge of any size in the world. All three members of this unholy “ triple alliance“ were united by one thing. Money. The Corporation of London controlled London Bridge and the lucrative tolls extracted from passengers crossing the bridge. The original bridge was such a good investment that it is still earning dividends today. 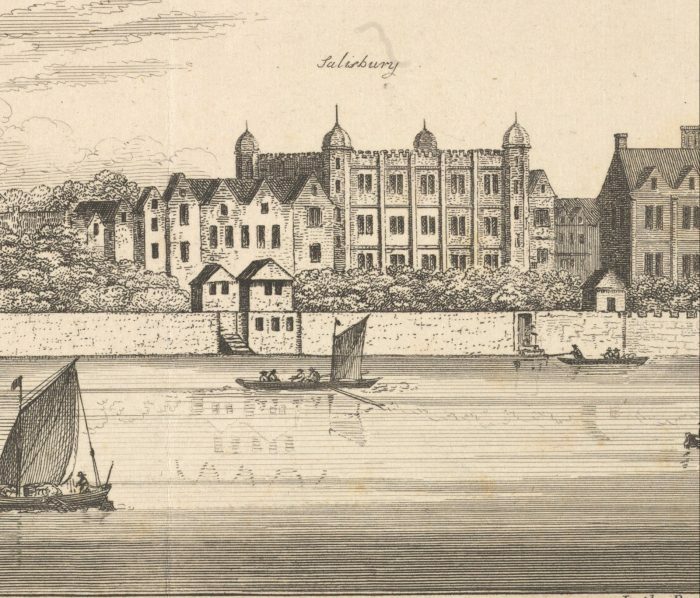 Further upriver at Lambeth Palace the Archbishop had a nice little earner from the fees charged for the horse ferry the Church operated. The road to Lambeth Bridge from Victoria is still called Horseferry Road. 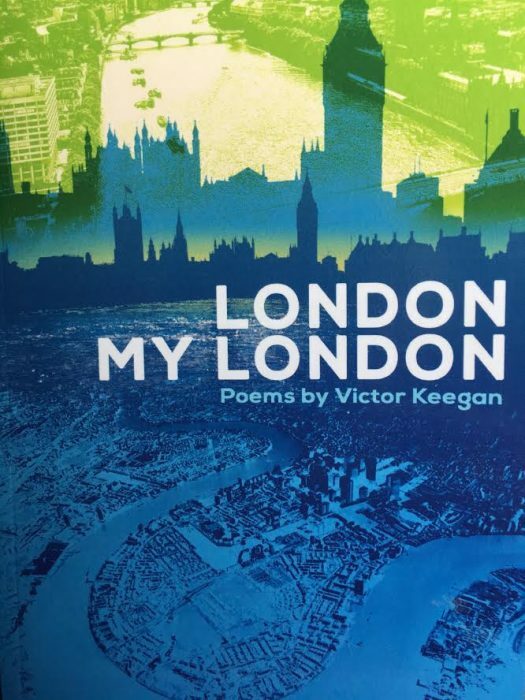 The main losers from a new bridge, would have been the “wherrymen“ who conveyed passengers across the river to the theatres and other entertainments on the south bank and also along the river from Deptford to Westminster. There were estimated to be 20,000 of them in London, a huge proportion of the population which was less than 200,000. The wherrymen were of course right. If new bridges had been built they would undoubtably have lost their jobs. You can imagine the confusion at the time if you had to catch the attention of thousands of wherrymen often foul-mouthed and badly trained, offering competing fees in order to attract custom. Samuel Pepys couldn’t stand them but they must have been the biggest employers in London by a distance. Such was the power of the watermen that they even succeeded in stopping Hackney carriages from being used in London for two years during the reign of James l. The equivalent of this cartel today would be if Britain’s biggest union, Unite, joined forces with the City of London and the Church of England to keep cars off the roads. Not even remotely possible. Watermen still exist today on a greatly reduced scale than before but much more highly trained through a five-year apprenticeship. If you walk down the little travelled thoroughfare of St Mary at Hill in the City of London you could easily pass by without noticing the Watermen’s Hall. 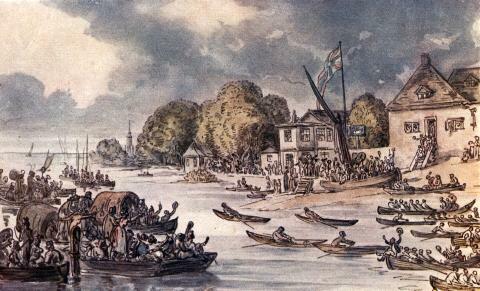 Today it is a flourishing gild which, unlike so many livery companies which have little connection to their historic roots, is still intimately involved with the River Thames through activitiies ranging from training programmes to organising events like the Doggett’s race and the annual swan upping ritual which monitors swans along the reach of the Thames. This is the story of two bridges designed by the same architect. One of them killed the other. If this sounds like a psycho-geographic thriller let’s start at the beginning. The old London Bridge – the one with buildings on top for much of its life – lasted over 600 years. It was London’s only bridge during that period thanks to one of the most successful restrictive practices of all time. It arose from an unholy alliance between the City of London which took tolls from London Bridge, Lambeth Palace which took tolls from the horse ferry at what is now Lambeth Bridge and the thousands of wherrymen whose livelihood of rowing people across the Thames was threatened. This 600 year monopoly was finally broken with the construction of Westminster Bridge in the year 1750 which acted as a starting pistol for a succession of other bridges. The most beautiful of these was the first Waterloo bridge completed in 1817 with Doric columns designed by a great Scottish engineer/architect John Rennie. It was regarded as the best designed bridge of its time in Europe. Canova, the great Italian sculptor who created The Three Graces, said it was “the noblest bridge in the world” and it was much painted by the likes of Monet and Constable. 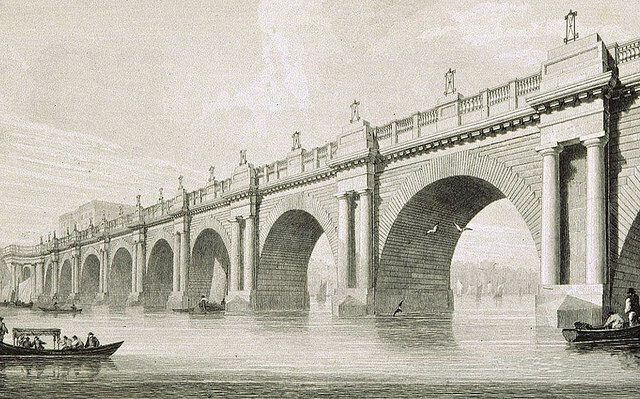 But Rennie also designed the replacement for the old London Bridge though it was completed by his sons. Unfortunately nobody thought through the consequences. The old London Bridge had 20 arches with narrow channels which greatly slowed down the flow of water. 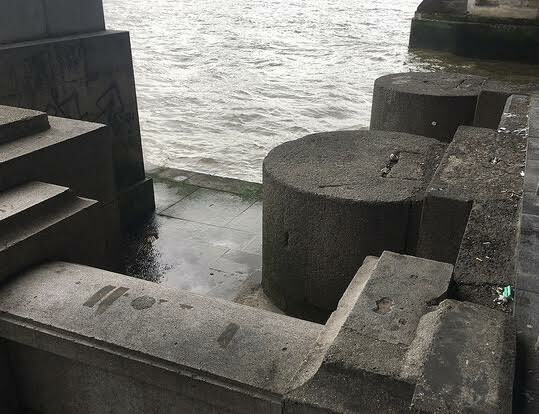 Once most of them were removed the flow of seawater from the estuary increased rapidly and, as often happens in similar circumstances, it started to erode the piers holding up Waterloo Bridge. From 1884 “scour” from the accelerated river flows from London Bridge was seriously damaging the foundations. In 1924 the bridge was considered unsafe and was closed. In 1936 Parliamentary consent for a new one was given to be designed by eminent architect Sir Giles Gilbert Scott. It was built using reinforced concrete clad in Portland stone with some of the grey Cornish granite of the old bridge also being used. Some of the remains of the old bridge can still be seen. So, take your choice was this just a case of bad luck it Or was it London Bridge taking revenge on Waterloo Bridge for helping to erode its lucrative monopoly? Only a psycho-geographer could answer that with a straight face. 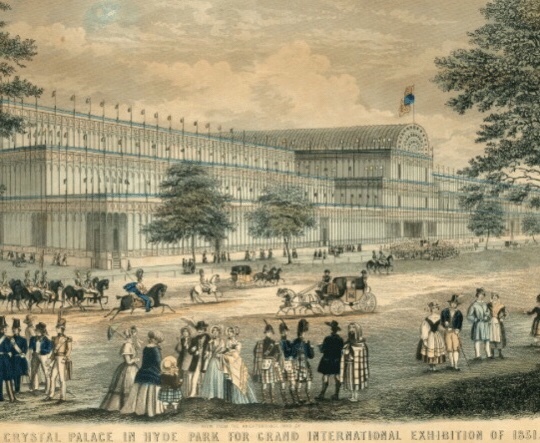 The original Crystal Palace – built in Hyde Park in six months to house the Great Exhibition of 1851 – was the biggest glass building in the world and quite possibly the biggest building of any kind. It was a roaring success visited by 6 million people and made pots of money during its intentionally short life of six months. But that wasn’t the end of the story. Thanks to the entrepreneurial endeavour of Leo Schuster and others it was transported to a new site at Sydenham in south London and enlarged to a size over 50% larger than the original by its formidable architect Sir Joseph Paxton. It was intended to propogate the history of art, sculpture and architecture. 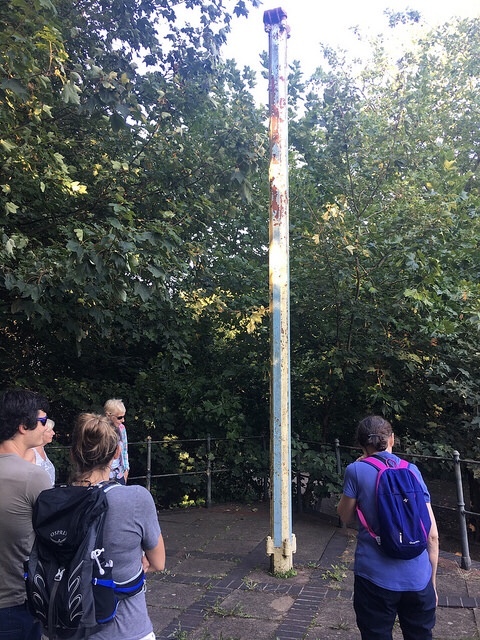 This is part of what it looked like inside https://tinyurl.com/ybv7y5z2 and, unlike the original in Hyde Park, which has completely vanished, some of the surrounding infrastructure of its Sydenham reincarnation can still be seen including the sole remaining stanchion from the glass and iron structure (photo above). 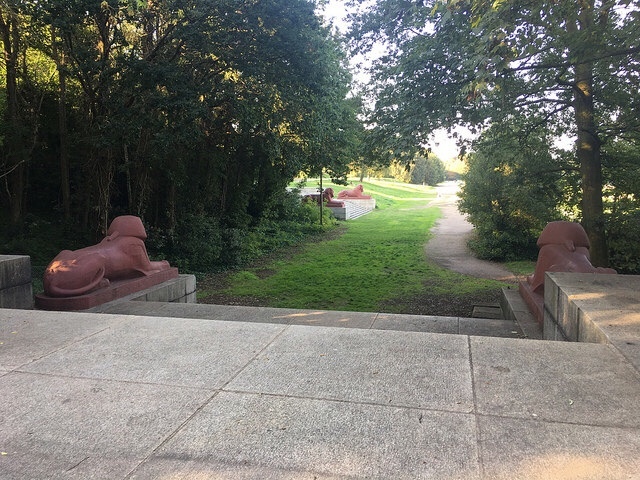 If you look at the remains from the parkland in front of the site it is difficult to believe that despite all the vast terracing and statues which fill your vision you can’t actually see the site of the former Crystal Palace itself which is hiding behind a row of trees waiting for a loose pocketed billionaire to rebuild a modern equivalent. Even so, there are plenty of reminders from the past including a sawn off base of one of the iron stanchions sticking out from a paving slab, the stub of one of the giant water towers (built by Brunel and used by John Logie Baird to demonstrate his new invention of television), sphinx-like lions still guarding the entrance and huge iron gate posts not to mention the custom built railway station which is still in daily use. And, of course, the dinosaurs. Although some are in need of care and attention they still stand sentinel on their own island, each of them Grade 1 listed surely making it the densest concentration of such top listed buildings anywhere. But pride of place must go to that stanchion, the only surviving remnant of the building itself. No-one knows whether it was from Hyde Park or Sydenham as they were all made to a set formula with no identifying marks – but there is a better than 50% chance they are the solitary reminder of the mind boggling success of the 1851 Exhibition. Six million people visited it and it marked the first time, thanks to the railways, that working people from all over the country mixed with the toffs without the social disruption that some had predicted. It made so much money that it helped finance the cultural hub of the museums in South Kensington and the company behind it still makes millions in profits today for creative causes. There has never been anything like it since. Sadly, the replacement at Sydenham was not so successful. Although at its peak it could attract half a million people in a single day there was no way that a vast attraction so far from central London could survive in those days. But its demise came not from financial difficulties but from a devastating 1936 fire which turned into an inferno destroying the entire building (which had a lot of wood in it) though the site still lives on in hope of being restored by a person or persons unknown. Curious fact – although the Crystal Palace marked the zenith of British industrial pride it was to two Germans that it owed much of its existence. The idea was the brainchild of Prince Albert, Queen Victoria’s German husband, and the transplanting to Sydenham was thanks to a consortium of eight men of whom the leading light was another German Leo Schuster. Oh, and labour had to be brought in from France to make sure the 900,000 square feet of glass was installed in time. A very British success story. 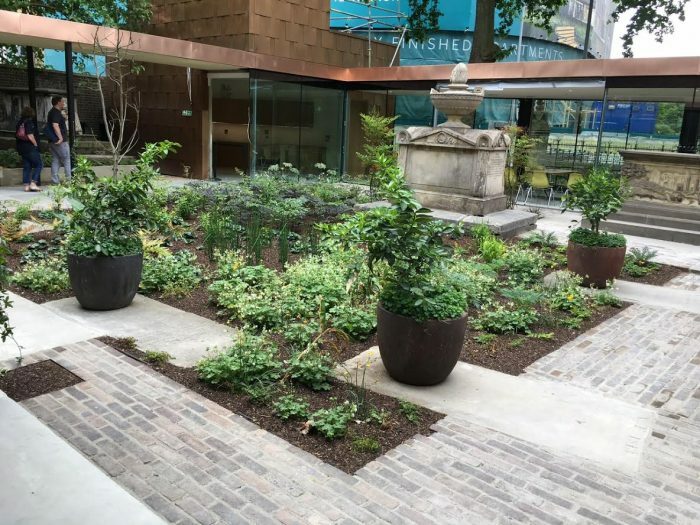 Shakespeare would have had to walk but we can visit the sites of three forgotten Elizabethan theatres – with not a plaque between them – by travelling two stops on the Thameslink line starting from Elephant and Castle and simply looking out of the window. 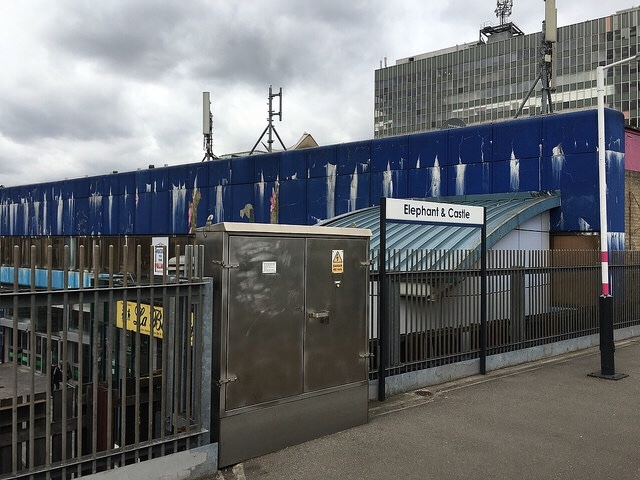 As the train comes out of the Elephant station – roughly on the site of the recently closed Coronet Theatre on your left – you can see where the Newington Butts playhouse once stood. This is one of the very earliest of the surge of theatres during Elizabeth’s reign. It is on record that in June, 1594, The Lord Chamberlain’s men gave the earliest performances of Titus Andronicus, The Taming of the Shrew, at Newington and an earlier version of Hamlet not written by Shakespeare. Julian Bowsher, the theatre archaeologist, says: “it is probable that Shakespeare acted there, possibly in 1593 and almost certainly in 1594”. Soon after leaving the Elephant as we are about to enter Blackfriars station we pass on the right a long undistinguished office block which you can almost touch. 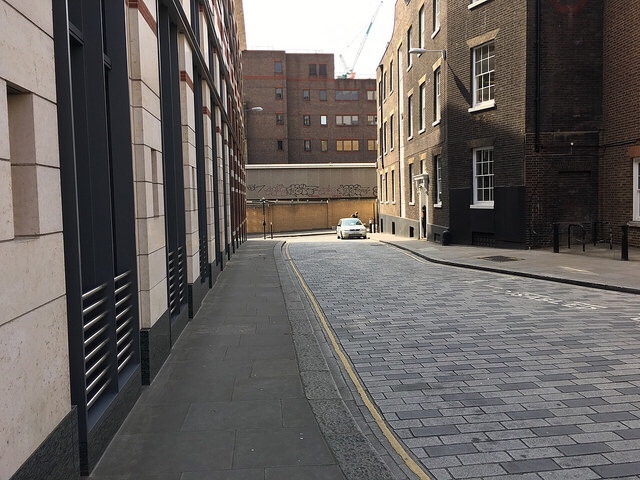 This is the site of the Swan Theatre, the biggest in Elizabethan times which could hold up to 3,000 people which is at least as big as any West End theatre today. Again no plaque or anything to suggest what it is. We don’t know whether any of Shakespeare’s plays were performed there but he would certainly have been familiar with it. 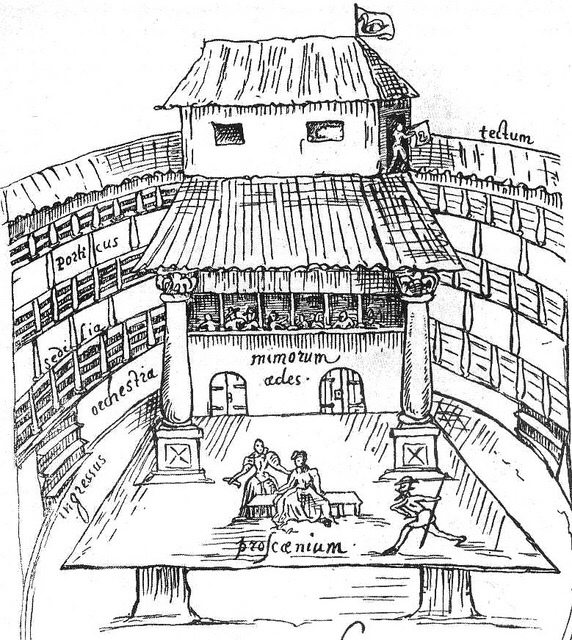 It is because of the Swan that we have the only sketch of what an Elizabethan theatre actually looked like. It was drawn by a visiting Dutchman and has become the template for thinking about how other contemporary theatres looked. The Swan was situated in an ancient estate called Paris Garden which was a “liberty” and therefore outside the jurisdiction of the City. It was a very seedy place. The Swan was situated close to Holland’s Leaguer, the most notorious brothel in the country which even had its own drawbridge to be pulled up when occasion demanded. 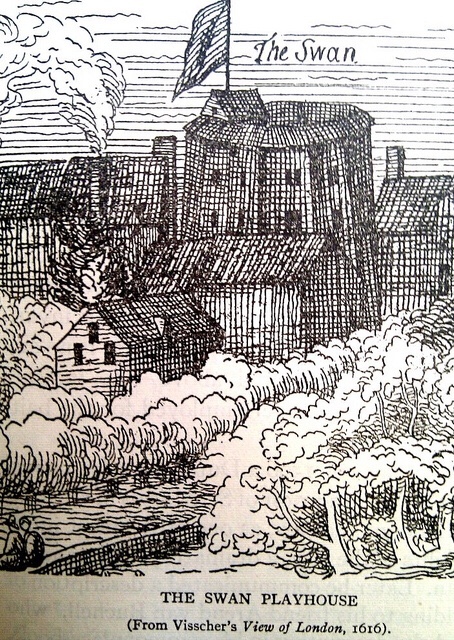 In 1597 the Isle of Dogs, by Ben Jonson and Thomas Nash was put on leading to their arrest for staging seditious material. Shakespeare must have lived nearby because in 1596 a restraining order was served on him and others by someone who feared that the person we know today as “gentle” Shakespeare might be putting his life at risk. Very shortly after leaving Blackfriars station on the right – don’t blink or you’ll miss it – is the entrance to a small yard which was the site of the indoor Blackfriars theatre where in his later days Shakespeare’s troupe made most of their money catering for richer audiences all year round. In Staunton, Virginia American Shakespeare lovers have built a replica of the Blackfriars theatre while in London, as with the other two theatres, there is not even a plaque. Londoners love Shakespeare in performance but until very recently have been curiously neglectful of his heritage. The most famous memorial to him – a replica of the Globe – was only built because of the dogged persistence of an American, Sam Wanamaker. 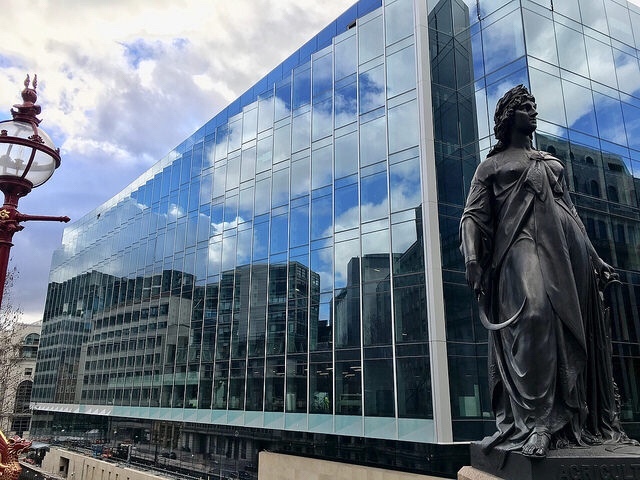 GOLDMAN SACHS, the seriously rich US finance group, has just built a huge £1 bn office block on Farringdon Street just south of Holborn Viaduct. What the Goldmen and Goldwomen may not know is that this temple to Mammon has been constructed on almost exactly the same site where the mendicant Dominican monks – or Black Friars – built their first London monastery in 1224. 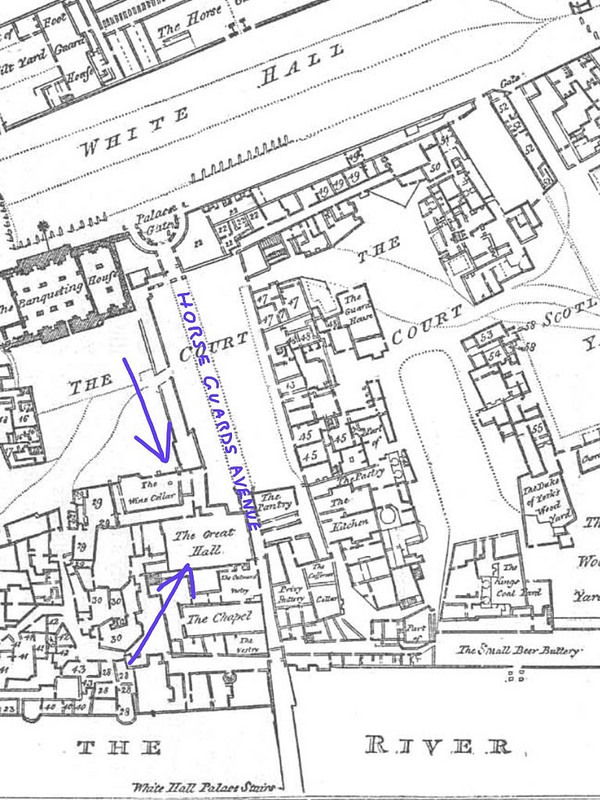 They later (in 1278) moved down the road to a space within the City boundaries by today’s Blackfriars station. It is tempting to contrast the opulent lifestyle of the Goldman Sachs toffs with the sombre routine of the Dominican monks begging in the streets – but wait. Life is not that simple. Piers Plowman, the 14th century poet from Malvern, railed against the lifestyle of the Blackfriars monks accusing them of debauchery and luxurious living. Goldman Sachs for their part have not always lived the high life. They have also been mendicants on a scale the Blackfriars monks could only dream about. In October 2008 during the sub-prime financial crisis amid fears that the bankruptcy of Lehman Bros could trigger a global collapse Goldman received a $10 billion boost (in preferred stock) from the US Treasury. In other words a mega bailout. Goodness knows what the monks of Blackfriars would have done with money like that. Like the monastery, the Goldman Sachs building is bounded on the east by Shoe Lane, on the south by Stonecutter Street and on the east by Farringdon Street. The only difference is that the monastery actually extended further northwards beyond Plumtree Court to under what is now Holborn Viaduct. Before Goldman Sachs came along the site in recent times housed a BT telephone exchange with a lovely ceramic mural outside (since removed to the Barbican). Before that it was a street market with a dodgy reputation for watercress. Life goes on. The statue on the right is of Agriculture on Holborn Viaduct. LEICESTER SQUARE is not famed for its churches. An exception is Notre Dame de France. Built on the site of the London pad of the Earl of Leicester in the 1630s, it was later the location of the world’s first 360 degree Panorama, the immersive reality of its day. It is in Leicester Street, a lane linking the square with Chinatown. Inside there is a lovely triptych (see below) by the cultural polymath Jean Cocteau barely known to Londoners but more than worth the visit in its own right. It depicts the Annunciation, the Crucifixion and the Assumption in a hauntingly beautiful way. It is the only church that Cocteau was involved with apart from the chapel at Villefranche sur Mer near Nice. 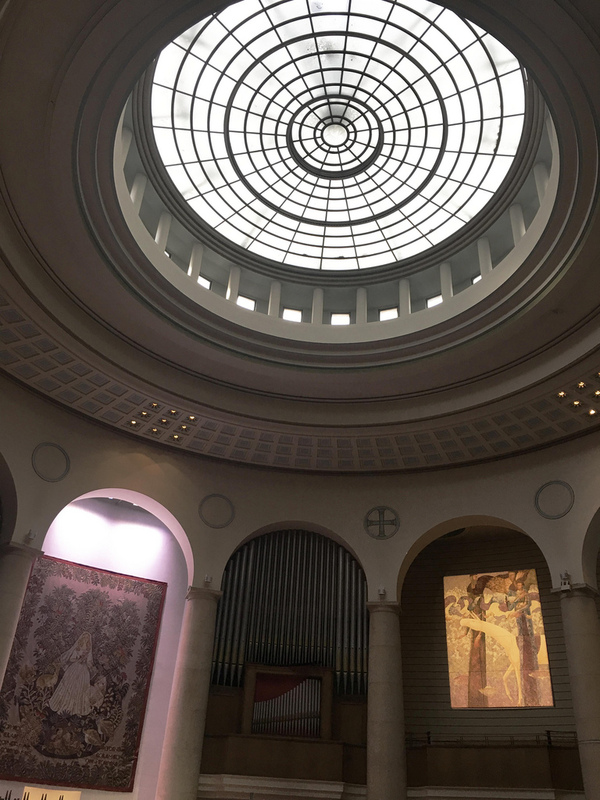 This is a working church – which maintains Christian traditions by allowing rough sleepers to slumber on the pews during the day – but these are not the only reasons why it is worth a visit. This is the site of the world’s first “panorama”. Indeed the word – from the Greek “pan” (all) and “horama” (view) – was coined especially for it. Built here by Robert Barker in 1793, it was the first panorama in the world and Barker made a fortune out of charging punters three shillings a visit for a 360 degree immersive experience spanning 250 square metres, the augmented reality of its day. Barker employed cunning uses of perspective to enhance the experience which had to be viewed on the same level so straight lines did not become distorted when looking down. A domed skylight enhanced the experience. One of his most successful panoramas was a view of London taken from the roof of the Albion Mill in Lambeth. Visitors moved from one panorama to another up stairs and through a darkened passageway to enhance the experience. They could buy a series of six prints of each panorama as a souvenir – which must be one of the earliest examples of merchandising. Barker’s invention spawned well over 100 imitations around the world. Every country wanted one. During the 1860s the Panorama was converted into a church to serve Soho’s growing population of French Catholics. 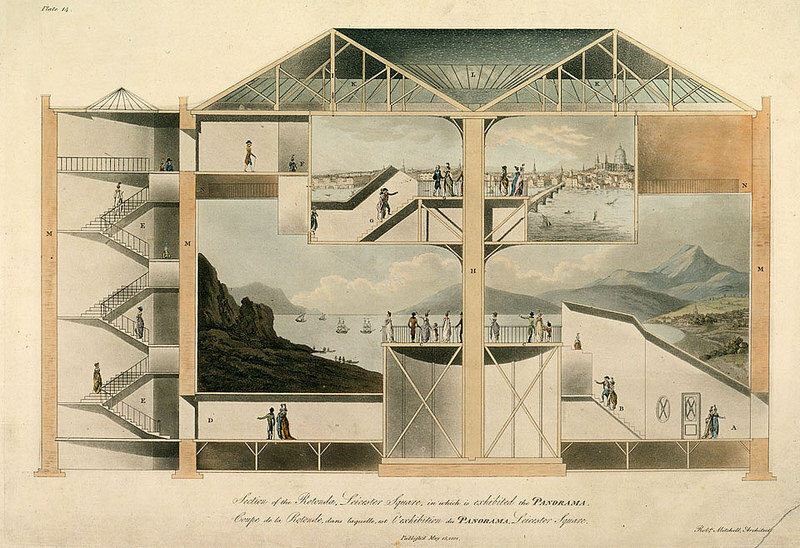 It was designed by a French architect within the circular shell of Barker’s panorama. The church was bombed during the Second World War and though extensively rebuilt the domed contours of the original building are still apparent. Doubtless there will one day be an app that you can point at the building to view it as it was – augmented reality’s tribute to itself. At 11 am on August 1, 1820 something unusual happened when the Regent’s Canal was opened making it possible to travel by boat from Limehouse in the east to Brentford in the west. Suddenly London (well, north of the Thames) technically became an island surrounded by water. It is not the first time this has happened. 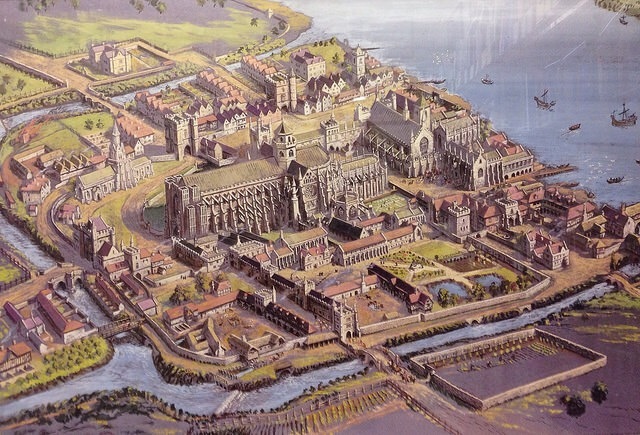 The centre of London was an island for hundreds of years when first a monastery, then an Abbey then a royal palace and then Parliament were all built on Thorney Island, the landmass formed by the convergence of the Tyburn river with the Thames at Westminster. Sadly, the pristine path of the Tyburn has long since been lost. The river still rises in the hills of Hampstead but its waters soon become overwhelmed by less salubrious ourflows from Sir Joseph Bazelgette’s amazing sewer system. 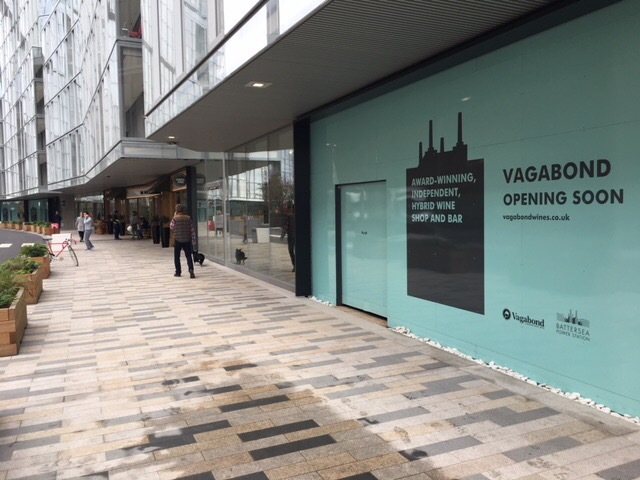 However, one section of it still meanders, albeit mixed with sewer water, under The Green Park and the Victoria Palace Theatre and under Vauxhall Bridge Road until it exits a few hundred yards east of Vauxhall Bridge. The other leg turns east around Buckingham Palace towards Thorney Island but is lost amid the sewage. You can’t amble around Thorney Island anymore but it is possible to walk the Regent’s canal along the towpath which I did recently, a long, tranquil meander along parts of London you would not normally encounter – through the bustling waterside cafés and pubs of Islington, Camden and Paddington to a prolonged country walk where the Regent’s Canal merges with the Grand Union and eventually joins the Brent which empties itself into the Thames at Brentford. For most of the journey it is difficult to believe you are still in one of the most populated places in Europe. 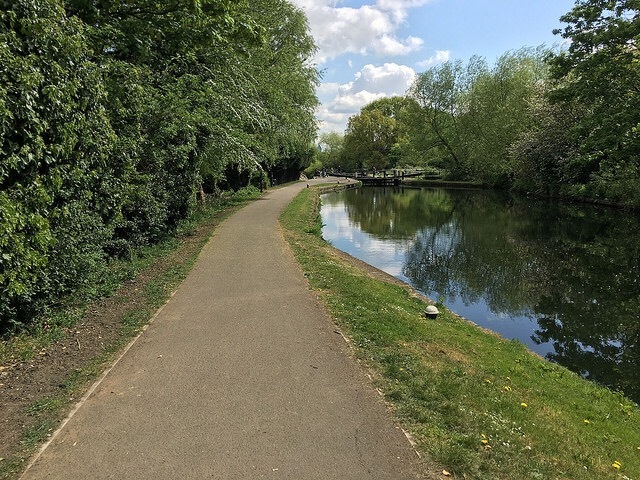 In earlier blogs I have pointed out that it is possible to walk from Trafalgar Square – the acknowledged centre of London – to Islington without actually crossing a road by walking by the Thames path to Limehouse and then using the towpath of the Regent’s canal to get to Islington. It is only because the tunnel which channels the Regent’s Canal under the centre of Islington has no towpath that it is not possible to walk further. Local residents objected to a towpath under the bridge claiming it would have provided an escape route for robbers. Had there been one under the tunnel it would have been possible to walk from Trafalgar Square to Brentford without crossing a road and, who knows, if one turns right at the junction of the Regent’s with the Grand Union maybe as far as Birmingham. I know of no other capital city where it is possible to walk so far without crossing a road. Transport for London has a statutory duty to promote walking but you seldom if ever hear of plans to build walkways in central London as they have done in New York and Chicago. Maybe we should make a start by utilising the money saved from not building the Garden Bridge. THE PHRASE “hidden gem” is the most overused way of describing curious places in London, not least by me. 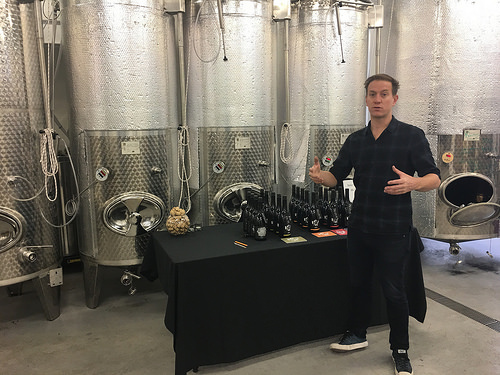 But in the case of the wine cellar constructed by Cardinal Wolsey – and later appropriated by Henry V111 when the Cardinal failed to get him a divorce from Catherine of Aragon – it is an understatement. 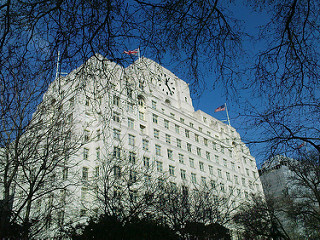 It is hidden because it is concealed deep within the bowels of the huge Ministry of Defence building which straddles the east side of Whitehall needing special permission and tough security procedures to view. 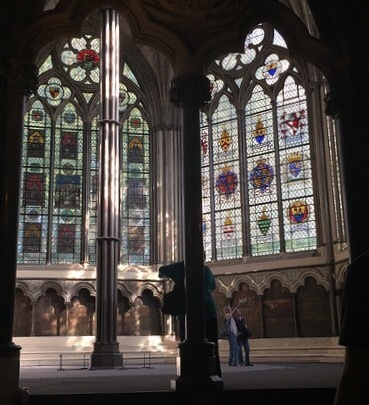 And it is a gem because, wow, it is the last remaining intact piece of Henry V111’s Palace of Westminster, which was once bigger – and certainly uglier – than Louis XIV’s Versailles. It was the palace of English monarchs for 200 years. What struck me after negotiating a series of stairways was not just the unexpectedly large size of the cellar itself but the way it is presented. It is designed in museum style, with large reproductions of paintings and maps and numerous boards along the outside walls. This explains the historical background to it as you walk around the outside of a mausoleum-style structure (see, below) that has encased the cellar since it was moved sideways (10 feet to the west) in its entirety and lowered almost 19 feet during the reconstruction of the building in the 1940s. This was needed to prevent it protruding 30 feet into Horse Guards Avenue. It was an impressive bit of engineering for the time. It took 90 men eighteen months according to a parliamentary answer at the time (though the current brochure says it was completed within three months). 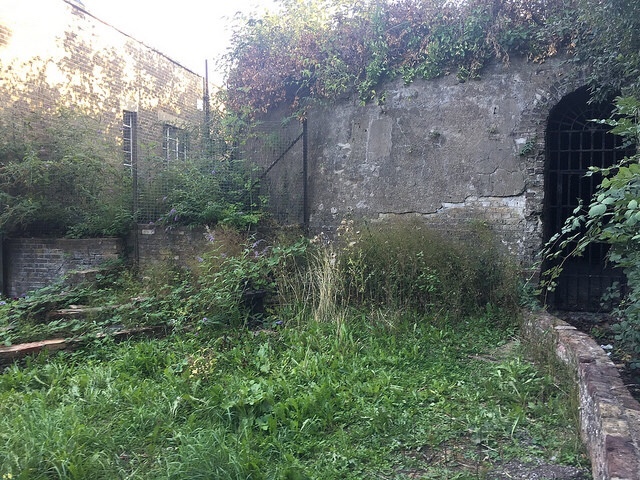 It is a sad fact that the wine cellar was only saved because of a public outcry when the architect’s plans were revealed leading people to believe that it would be demolished. 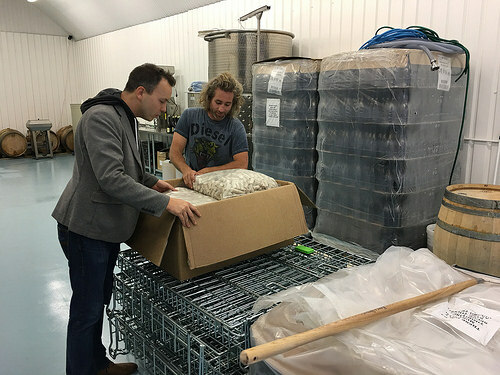 Entering the wine cellar itself really is like falling into a time capsule. In the depths of a building where battles are planned and nuclear tactics discussed is one of the last remains of Tudor London just as it was almost 500 years ago bar a bit of restoration including replacement stones, a lick of white paint on the walls and some more recent wine barrels at each end to recreate part of the atmosphere of a bygone age. There is a stark beauty to the columns and the vaulted ceiling made of sculptured bricks which come together in “V” shapes. There is bit of unfinished business. 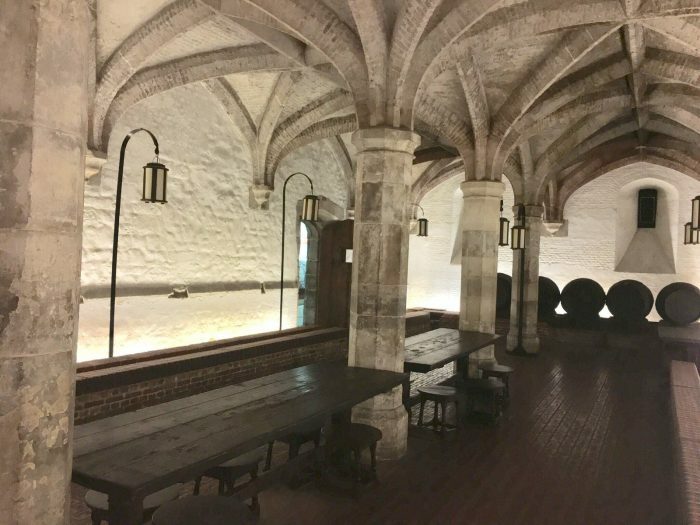 The wine cellar was very close to the Great Hall of Wolsey’s Palace where in later years some of Shakespeare’s plays were produced. I read somewhere that part of the wall of the hall can still be seen. Does anyone know? There has been speculation about what sort of wines were stored here to slate the Cardinal’s thirst. 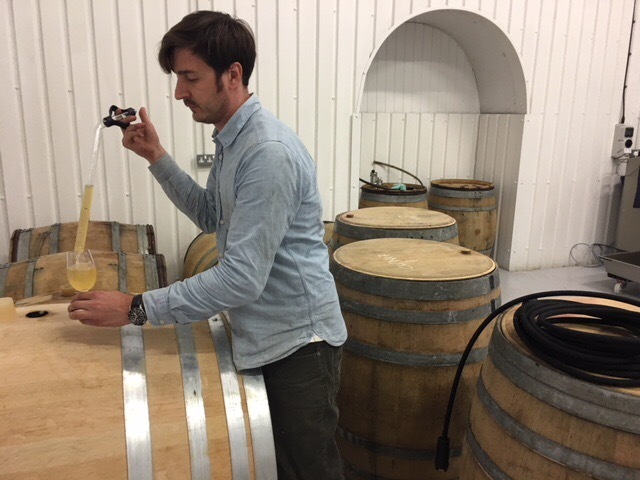 England – and London – were not short of vineyards in those days but it is presumed that Tudor snobbery – oops, sorry, taste – would have ensured that most of the wines would have come from France including, possibly, from Champagne (which in those days was a still white wine). It is a sad fact that because of its location and the security involved it is unlikely ever to be opened to the public – unless of course, the Government sells the building off to a hotel group for re-development. 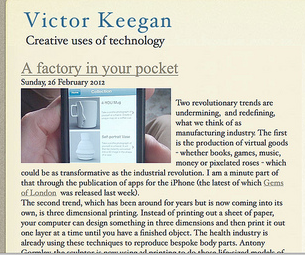 On recent trends, I wouldn’t bet against that in the long term! A memorable experience and I am most grateful to Cdr John Aitken for showing me around. If you walk along the Strand today in the direction of Waterloo Bridge you will probably pass by number 80 (photo below) without even noticing it. It is actually the entrance to what used to be called Shell Mex House formerly the HQ of Shell Mex and BP which is more recognisable from the Embankment end because of its Art Deco clockface, the biggest in London. Actually it is not what it seems. It is not the entrance to Shell but the shell of a former building, the Hotel Cecil, in it’s day the biggest hotel in the world. If you enter into the courtyard and turn around it is obvious that what you are looking at is the rump of the former hotel now used as offices. The Cecil Hotel needs a book to do it justice.If you walk through the entrance you will see a substantial portion of the Strand Facade of the former hotel. It was built by a Victorian fraudster and Liberal MP Jabez Balfour using funds from his Liberator Building Society, the biggest in the country before it crashed in 1892, depriving thousands of small investors of their savings. 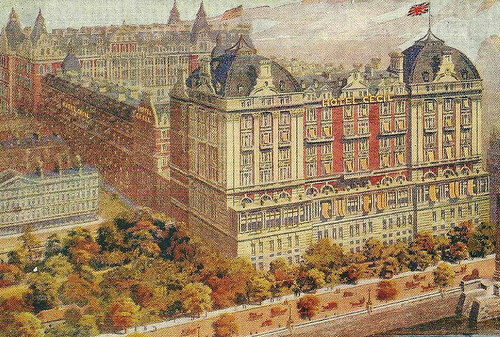 Balfour absconded to Argentina where he lived for a few years before being captured but the hotel was rescued by the liquidator after a new company was formed to complete it. It was big. The main dining room could serve 600 customers, the second one 350 and the third 200. It was a hugely popular place for dancing and eating during the roaring 20s particularly with American visitors. It was called Hotel Cecil to preserve a link with the almost equally large building, Salisbury House, which was built on the same spot by Sir Robert Cecil Secretary to State to Elizabeth 1 and James 1. It was one of the chain of grand palaces that occupied the whole of the space between the Strand and the Thames as immortalised by the drawings of Wenceslaus Hollar the Czech engraver. 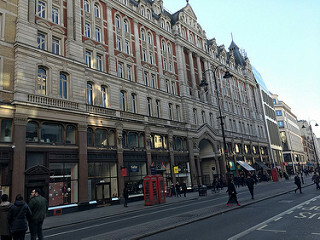 It is not to be confused with another Cecil House built on the opposite side of the Strand by Sir Robert’s dad Lord Burghley which was constructed on the site of today’s Strand Palace Hotel. The fact that these three buildings were all built on the same site on the Embankment reflects the Capital’s unending re-invention of itself. There is an enbedded link between the existing building and the hotel but it is an open question how much of the stone and bricks of Salisbury House are still extant in the walls or foundations if surrounding buildings. 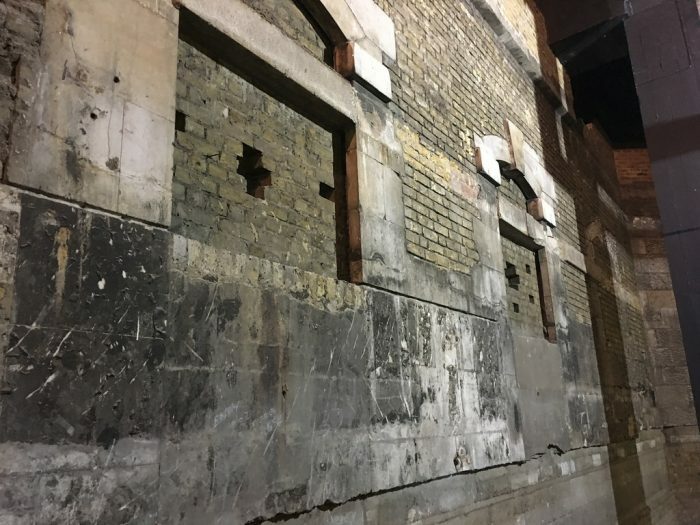 It is one of the features of London – helping to explain why street levels are much higher than they were in Roman times – that building materials are conveyed into London and mainly stay there. 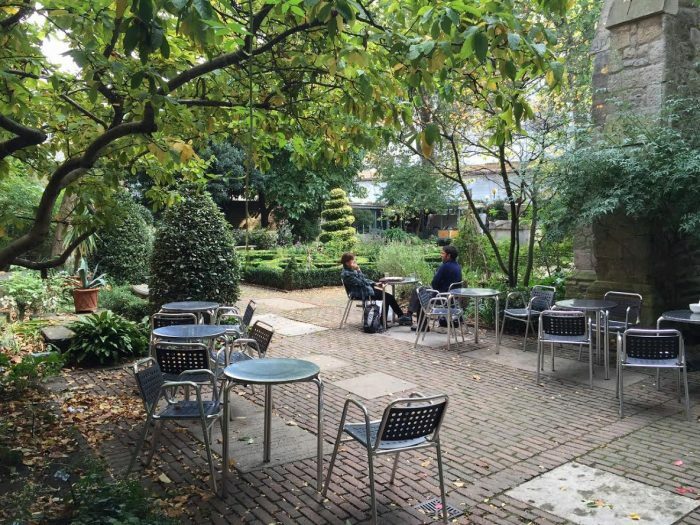 THE HISTORIC Charnel House in Spitalfields has been much written about by enthusiasts but rarely seen – even by people who live and work in the area. I gave up asking people where it was yesterday and, rather ironically, had to rely on SatNav to find the only medieval remains in Spitalfields, indeed in the whole of Tower Hamlets. The reason passers-by – including yours truly in times past – miss it is that has been beautifully and cunningly preserved. There is a glass floor at street level which you wouldn’t notice unless you knew you could observe the remains underneath. To see properly you must go down stone steps and peer through glass at the bulk of the remains including a recent dark sculpture to add an extra touch of the macabre. It is a bit like looking into a medieval aquarium. The Charnel House was at the perimeter of the very large ancient Priory of St Mary Spital (short for hospital) where they kept the bones – mainly heads and legs – of the deceased so prayers could be said for the repose of their souls. It dates from the early 1300s though the hospital – which derives from the word “hospitality” – was founded in 1197 on the site of what is believed to be a much earlier Roman cemetery. 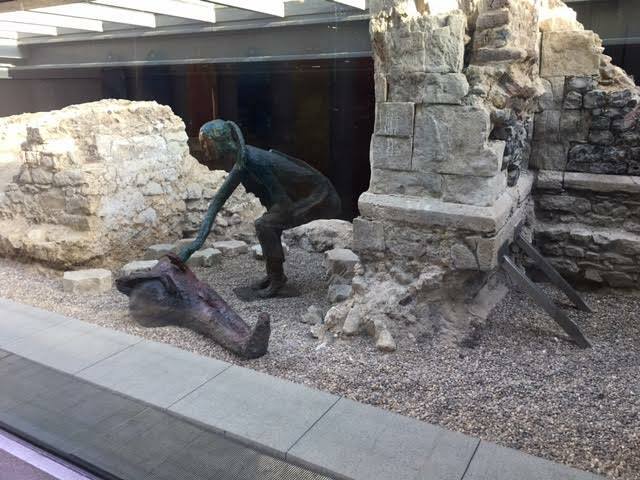 At a time when the people of Spitalfields are resolutely fighting for the preservation of their more recent heritage the Charnel House stands as a fine reminder of how it is possible to preserve the past within the present. It is to be found under the Norman Foster building at 1, Bishops Square.